The latest sales estimates for wearables are out, and the Apple Watch continues to lose ground against inexpensive fitness trackers like Fitbits, according to a new estimate from IDC. Apple shipped 1.1 million Apple Watches in the third quarter, IDC estimated, down 71% from the 3.9 million it sold a year ago in the same quarter. The other top 5 wearable companies, Fitbit, Xiaomi, Garmin, and Samsung, all saw annual gains. All four companies aside from Apple sell low-cost step trackers, which have found success because they are simple and solve a single problem, as compared to the Apple Watch, which offers fitness, notification, and app store platform features. 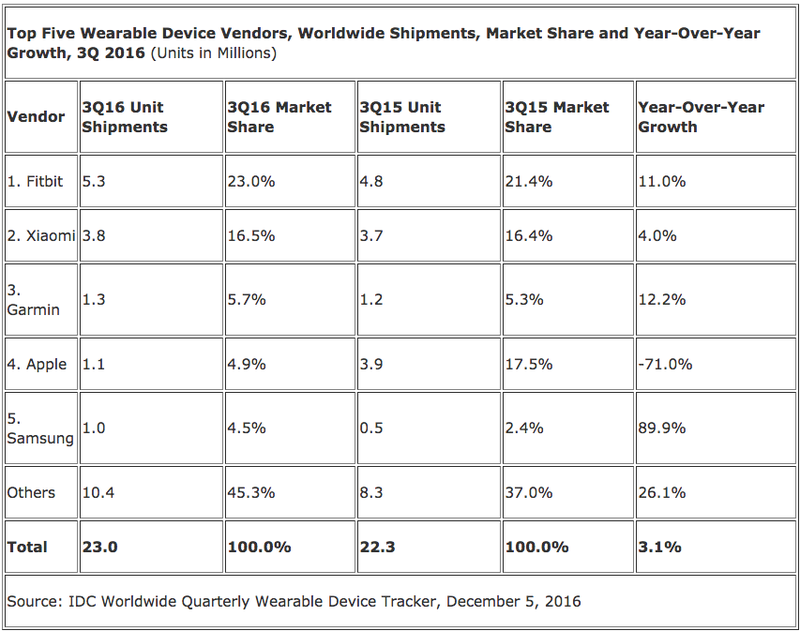 "Where smartwatches were once expected to take the lead, basic wearables now reign supreme. Simplicity is a driving factor and this is well reflected in the top vendor list as four out of five offer a simple, dedicated fitness device," IDC research analyst Jitesh Ubrani said in a statement. Apple's decision to launch its second-generation watches in mid-September, towards the end of the quarter, did contribute to its year-over-year decline in 3Q16. However, the primary reasons for the downturn were an aging lineup and an unintuitive user interface. Though both issues have been addressed with the latest generation watches, Apple's success will likely be muted as the smartwatch category continues to be challenged. The fourth quarter will be critical to Apple's smartwatch as retailers discount and promote the product that CEO Tim Cook expects to be a seasonal product, "similar to the historical seasonality of iPod." Apple needs a strong holiday season to buoy Apple Watch sales, which it has never publicly revealed.